In August 1986, a game of quick chess was played at the U.S. Open in Somerset, N.J. The board was vinyl, the pieces were plastic, and a Jerger wooden chess clock sat next to the board. While the set may have been common, the players were most certainly not. Playing with the white pieces was GM Reuben Fine. GM Samuel Reshevsky played black. Both were legends, second only to Bobby Fischer in American chess history. 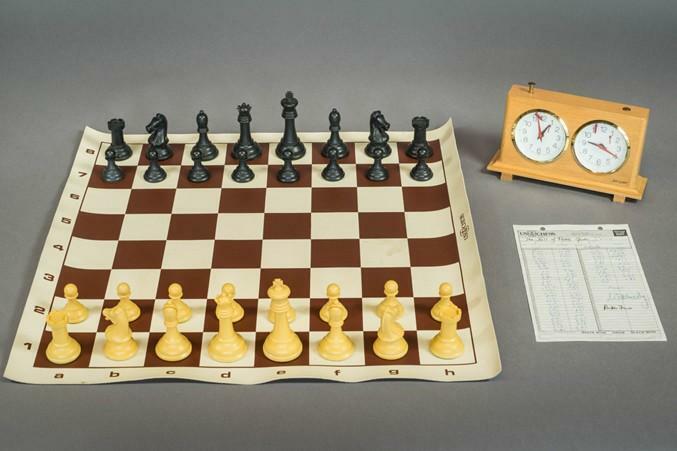 The timing for this specific game on this chess set was also notable: It was the first induction ceremony for the U.S. Chess Hall of Fame. It is only fitting that the Hall of Fame was opened by a game between two of its most illustrious inductees. Not only was Reuben Fine one of the world’s best players for nearly 20 years, he was also a doctor of psychology who wrote several books on that subject as well as on chess. Sammy Reshevsky was a child prodigy who was a strong contender for the World Championship from the 1930s through the ‘60s. 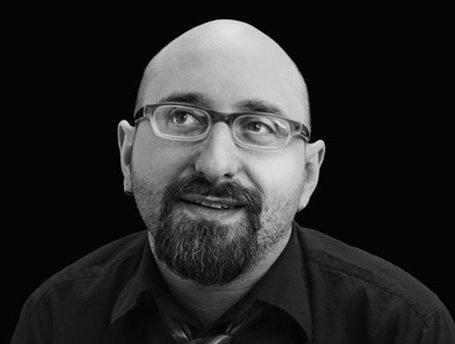 Fine won the U.S. Open seven times to Reshevsky’s three (once tying with each other); but, Reshevsky had a tendency to beat Fine at the U.S. Championship, winning it eight times while Fine always seemed to come up just short. Stats like these make it clear the two had an excellent and well-matched rivalry, with Reshevsky coming out on top with four wins to Fine’s three and 12 games that were drawn. Below are presented a few of their notable battles, including the game played at the opening of Hall of Fame. Fittingly, the 1986 U.S. Open was won by another American chess legend, GM Larry Christiansen. The first career game between the two champions took place at the Western Open in 1933. Just the year previous, Fine won the U.S. Open ahead of Reshevsky. In this game, however, it was Sammy who got the better of the duel with a fine exchange sac. The following game was a battle played out in their respective primes at the 1938 U.S. Championship. Reshevsky had the much better side of the draw, and later went on to win the event. Here is a faster game they played on the set that now resides in the World Chess Hall of Fame. Both champions were in their 70s and hadn’t faced each other over the board in more than 30 years. Fine had excellent chances to convert a rook ending, but a few slips towards the end of the game allowed Reshevsky to escape with a draw. Overall, a rivalry such as this makes a seemingly ordinary set one that must go down in history. Not only does it represent the game of chess at the highest level, it stands for the intensity of the sport that has and will capture the hearts of fans for generations. If you would like to view this historic chess set, it is on display for the month of September at the World Chess Hall of Fame. The World Chess Hall of Fame will be honoring its five year anniversary with a celebration on Sept. 29 from 6-8 p.m. where attendees will be able to see three brand new exhibits, as well as the aforementioned chess set. 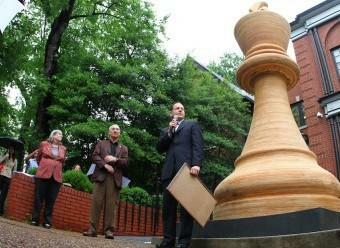 For more information about the featured chess set or upcoming exhibitions, please visit http://www.worldchesshof.org/exhibitions/. GM Josh Friedel began playing chess at the age of three and entered his first tournament at just six years old. GM Friedel received the IM title at 18 and proceeded to earn the GM title at 22. He is a 3-time New Hampshire State Champion, as well as a 2-time California State Champion. GM Friedel has played in six U.S. Championships and won the U.S. Open Championship is 2013. The Saint Louis Chess Club welcomes GM Friedel as a regular grandmaster in residence. The link between the creation of history and the preservation of heritage is about as streamlined as it gets these days: Just send it across the street. In chess, the queen is recognized as the most powerful piece. It can move in any direction, making it desirable yet unpredictable. Centuries ago, however, the queen didn’t exist. Around the 15th century, when Queen Isabella I of Spain and Queen Elizabeth I of England came to power, so too did the queen in chess. For the next six months chess and hip-hop will live under the same roof here in St. Louis. "Living Like Kings: The Collision of Chess and Hip Hop Culture" is an ever-evolving exhibit examining the relationship between the two art forms. Hip-Hop Chess Federation founder Adisa Banjoko, 44, thinks hip-hop and chess share a common noble truth. “The spirit of competition in hip-hop and in chess is what helps us figure out who we are,” Banjoko said.